It’s 1380, and a troupe of actors travel across England. Paul Bettany (Master and Commander), Brian Cox and Willem Dafoe star. Even if The Reckoning isn’t Bergman’s Seventh Seal, it promises to be something other than a mass-produced, Hollywood formula film. Unfortunately, The Reckoning breaks that promise after about half an hour. This intriguing film about secrets and the history of acting devolves into an airport paperback murder mystery, complete with talking villain and Disneyesque ending. Bettany starts out as Nicholas, a country priest, but a quick montage shows his ostracism for sleeping with one of the local girls. He hikes through the dark and misty countryside and comes upon a troupe of actors, whose eldest member has just died. Nicholas sees safety in numbers, and he throws his lot in with the troupe. They detour into a village overlooked by a castle, arriving just in time to see sentence passed on a woman guilty of murdering a boy. One of the interesting tangents the movie flirts with is a history of the theater. 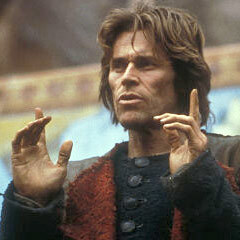 Mark (Dafoe) has some radical ideas about what actors can do. He proposes to tell a story, not from the Bible, but from everyday life. This is a heretical notion to the oldest member of the troupe (Cox); the rest of them are undecided. They perform their usual play and don’t even make enough to pay for a proper burial for their friend. Unable to leave because of a broken axle, Mark proposes they try his new technique. In the morning they research the story of the guilty woman. That afternoon they put on a morality play based on her crime. The audience is rapt at seeing this new type of play, one based on their own stories. But the troupe loses the crowd when it shows the “innocent, little” boy being led astray by the witchy woman. “That’s not how it happened!” they cry. “My son would never do that!” Clearly the actors didn’t get the whole story. (There are spoilers in this section.) And so the paperback plot rides in. Nicholas becomes obsessed with solving the mystery and freeing the innocent woman. The pens of fellow critics could be heard scratching “The Name of the Rose” in their notebooks. For an airport myserty, The Reckoning is probably a cut above your standard police procedural. The key actors are all talented and fascinating. The setting allows for some interesting costumes, cinematography, and special effects. The foggy, marshy look mirrors the sense of mystery and injustice. But when the tangents are more interesting than the plot, the wrong movie has been made.